As you know I have stepped up my interactions with the Rakyat this year, by taking new approaches to engage with all of you a lot more. I have begun hosting gatherings with my online friends around the country, increased my interaction on Twitter by replying to your tweets whenever I can, and even made a radio appearance! This month has been packed with international trips to Indonesia, Saudi Arabia, Qatar, The United States, United Kingdom and currently Japan, so I have not been able to meet as many of you as I would like. However, that doesn’t mean our interaction stops. A lot of work is currently being done to ensure that the 1Malaysia dialogue continues at a good momentum. 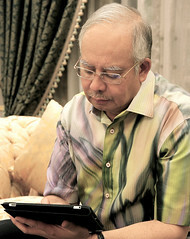 In June, I will introduce two new interactive platforms: a mobile app and the online 1Malaysia Roundtable. The app integrates all my online platforms including my website, Facebook and Twitter so that you can connect with me more easily! Instead of switching between different interfaces, you can leave comments on my blog or Facebook, tweet me, and register for upcoming gatherings using a single application. Insya-Allah, I will introduce additional apps in the future. I am very excited about the online 1Malaysia Roundtable via 1Malaysia.com.my. You know that I have always made it clear that direct engagement with you is important to me. However, I also acknowledge that my time is limited, and there are a number of obligations that I must attend to daily. Hence, I came up with the Roundtable, where you and your fellow citizens can discuss ideas that can contribute towards nation-building, guided by Malaysian subject matter experts from various fields. These subject matter experts will assist us in shaping these online discussions and sharing your ideas with me. I won’t say more about these two platforms for now, but I hope you are looking forward to using them very soon. There are other exciting plans in the pipeline, but most importantly, I hope that you use these opportunities wisely and help me in making our nation better and in becoming the fully-developed, high-income nation we can all be proud of! As always, your thoughts are most welcome. Let’s keep the conversation going! "Coalition of Moderates and Inter-Civilisational Understanding"